Libby on the Label: #52 Ancestors Week 5 - "In the Census"
#52 Ancestors Week 5 - "In the Census"
My mom didn't know her mother. She never talked about it. When something bad would happen she'd some times have a brief pity party. Growing up without her mother would go on the list of all the ways life isn't fair. That's about it. I didn't know anything about my maternal grandmother. No pictures, no stories, nothing. I found out how my grandmother died after pouring over her death certificate. Because there is that disconnect in my mom's lineage, there are no links to the matriarchs in her family. The all important mitochondrial DNA! My grandfather remarried and the step mother is the only one mom ever knew. (Side note, she was not a very nice person). When I started researching the family tree, I had both fingers crossed that I would be able to learn something about the maternal grandmas and grandpas. I hit a roadblock finding anything other than a name for Winnifred's mother. Sarah Maus. Was she German maybe? There was her maiden name on the marriage license - transcribed as Sarah Maus and her husband ... Heyethat Wert. (It's Hezekiah West). I kept searching for Sarah Maus for months until I thought to look at the actual document. The "w"s in the word Howard gave me the idea that maybe her last name was Maw, not Maus. I searched for Thomas, Charlotte and Sarah Maw in Bothell, Howard, Ontario. 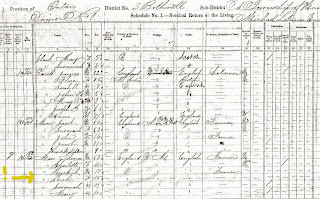 The Maws were in the 1871 census.There were siblings too, oh joy. This was the missing link, and opened the door for a huge flow of information. Parents Thomas and Charlotte now have approximate birth years in England. With more searching I found the exact town Thomas emigrated from. The tiny farming village of Wroot, Lincolnshire, England. Charlotte MacBrayne Moor Maw was from nearby Wrawby. Great grandmother Sarah Maw died when she was 36. My grandmother was just 10 years old. 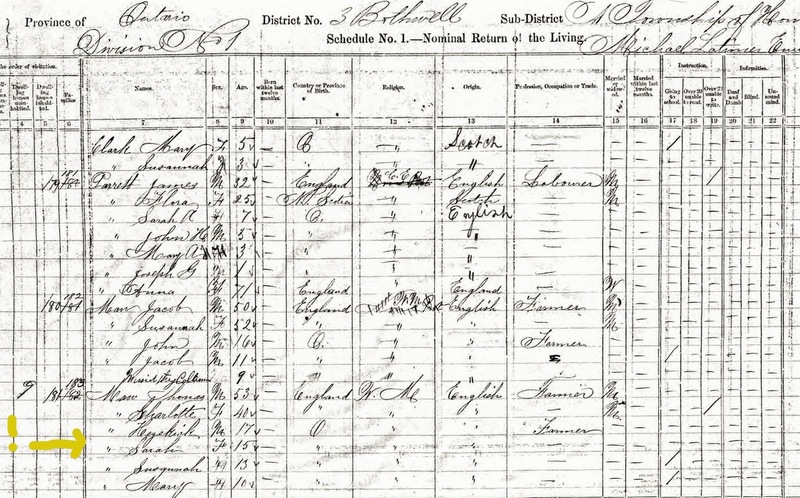 I found Winnifred in the 1901 census living with her paternal uncle Cornelius and his family. 18 years old and a dressmaker. There was a girl cousin her same age. Thank goodness! The following year she would marry my grandfather. A sad pattern for the mamas in this family. Great grandmother Charlotte Moore Maw also died young at age 41. How sad to have several generations of mothers who died so early. And, I can imagine your mother might have felt survivor's guilt. How sad! I love your idea of a "big celestial group hug" and hope it is happening! 😇💗 i bet they're making up for lost time!